We stayed in Ilhabela for 8 days waiting for the right winds. The Pinda Yacht Club kindly allowed us free use of one of their moorings while southerlies kept coming, including 40 kts gusts at one point. It was a bit bouncy at times and we didn't go ashore but we were fine. Finally on Friday we were able to row ashore for shopping and an advance birthday lunch for Paul. We really liked Ilhabela, with its active sailing community and pretty environment - though it's probably best avoided in high season (like Dartmouth). We left on Saturday morning - Paul's birthday - and managed to sail most of the day with the wind astern but then it became light and mostly from the south or west so we had to burn diesel all day on Sunday. For the last week or so the skies have been overcast and temperatures down to the low 20s so our only consolation was that the swell was tolerable. 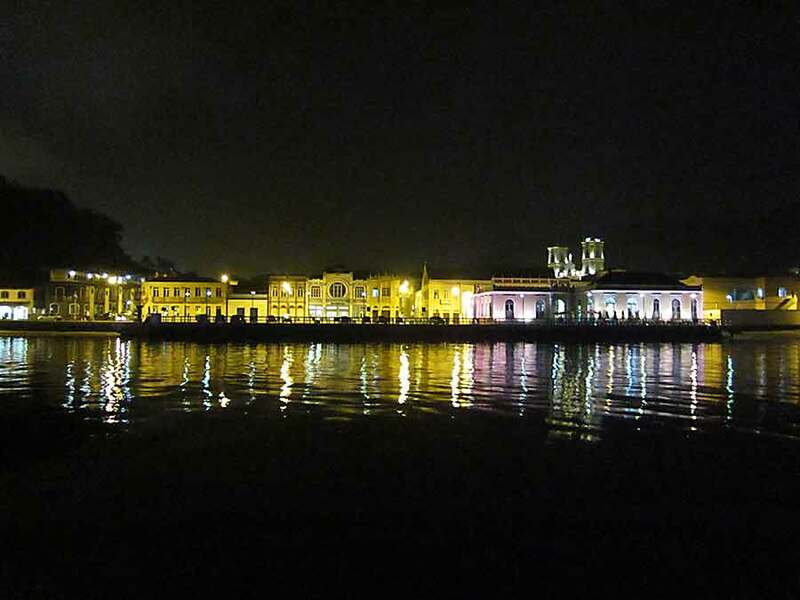 Our destination, the town of Sao Francisco do Sul, is inland, a short way up the Rio do Sao Francisco. Arriving with the incoming tide on Monday morning, we decided to stop first at the Capri Yacht Club to refill our diesel tank. The approach is very shallow and the depths at the fuel berth barely enough at mid-tide. We made our way in only to find that the fuel pump was out of action! Discussions ensued and, reassured that the pump would be repaired in time for high tide the next day, we stayed overnight in one of the Yacht Club berths, a peaceful spot close to the river entrance, low-lying with mangroves and plenty of birdlife. 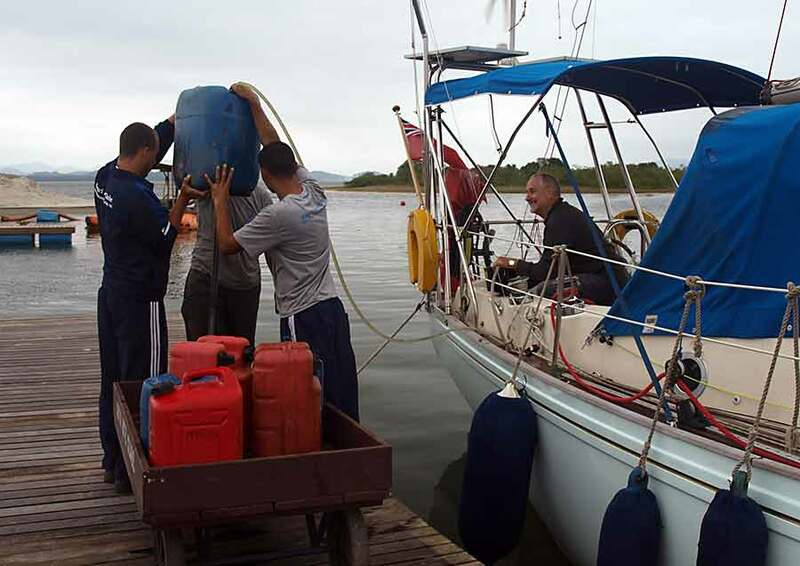 The next day we returned to the fuel berth at high tide to be told that they could only sell us 40 litres! More discussions followed. A pick-up truck and jerry cans were organised to collect the 200 litres we wanted. Finally we left and motored up river and anchored close to the town. All hands to the er siphon - once the yacht club chaps realised what was needed they were very helpful!. We didn't know what to expect. 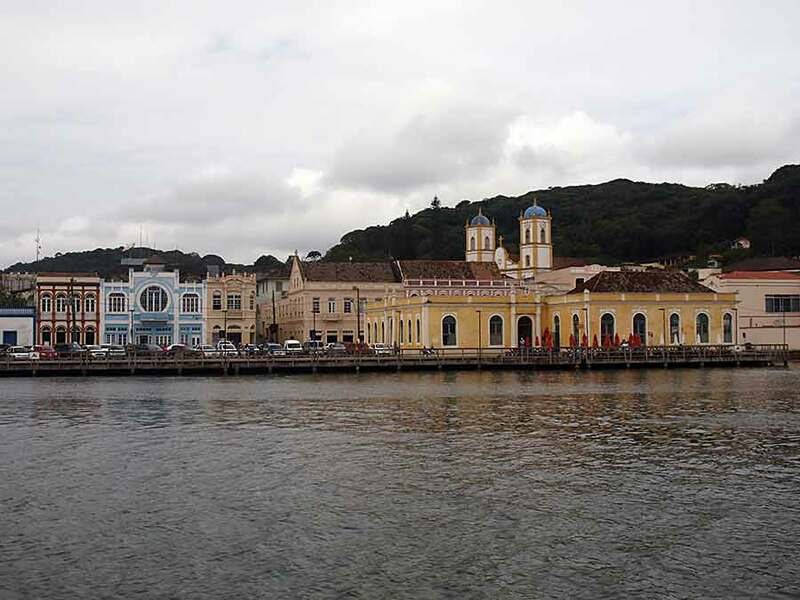 SFdS is the third oldest town in Brazil and apparently a major tourist attraction but in the wintry weather it is not impressive. We rowed ashore and soon found that it's a charming place, though probably like Dartmouth (best avoided in high season). An attractive riverside town, but hard to tell if it was livelier by day . . . The weather forecast was once again telling us to move on quickly. After visiting the Maritime museum on Wednesday morning we got ready to go, hoping for a good sail south before more southerlies set in.